JioPhone was introduced on July 21, 2017 as ‘India Ka Smartphone’ at a price of Rs 0. Yes, you heard me correct, the device will be available for free. But, the buyers will have to deposit Rs 1500 to get the smartphone and this amount is refundable. 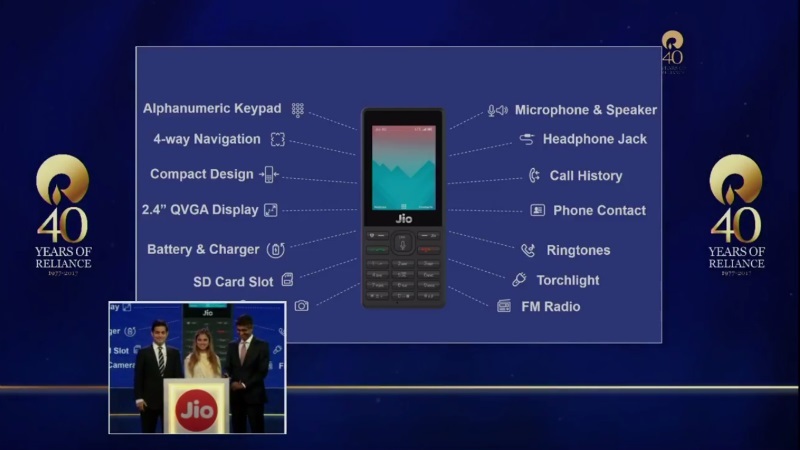 Here in this post, we will have a look at the JioPhone plans. Jio was launched by Mukesh Ambani last year aiming only the 4G bandwidth users and most of them use high-end smartphones to access the 4G services. With JioPhone, the company is planning to expand its services to an estimated 50 crore members who rely on small feature phones for communication. The mobile also comes with 4G VoLTE support, therefore the calls are absolutely free and the services like JioMusic, JioTV, JioCinema can also be availed. The phone will be rolled out for testing initially from August 15 and will be available for pre-booking from August 24 via Jio offline stores and MyJio app. Those who pre-book the feature phone will get it on a first come first serve basis. Users can choose to pay Rs 153 per month to get free voice and SMS, unlimited data ( 500 MB FUP limit per day) besides the Jio apps. Additionally, the users can also pay Rs 309 per month to get all these benefits and mirror their screen to CRT TVs using a cable. After 3 years, you can get a full refund of the deposit when you return the phone. There is also Rs 24 for two days, Rs 54 per week plans for those who don’t want to go for Rs 153 and Rs 309 plans. According to Gadget360, the JioPhone does not support the WhatsApp at the moment. We can expect it to be added later. Do you think the introduction of Jio in India has changed the Indian Telecom Industry? Let us know your views in the comments section below. We’d love to hear about it from you.